First, let's clear up the terminology. Election project databases are like a nice frosted layer cake with a jelly filling. Each part is distinct yet combined together they make a delictable treat. When we refer to database structures, we're talking about the various components of your database. Computer data comes in files or tables that you create or that someone ships to you. You have to put the data into its own layer, i.e. data structure. We can't teach you how to be a database guru in this course and you'll have to rely on technically knowledgeable people to work with you, but we can show you and your technical assistance team some of the ways that data has been managed in voter projects. An online system that contains a copy of your in-house member file merged with the voter file. An online system that contains your online member file matched to the voter file. or you might only have access to it through an internet based system that you can use to pull walk lists and enter canvass results ("external file"). Each type of file requires a different approach. If you organization is new to voter work, it's not likely that your database has a voter list table included in it. After you engage in a voter education project, find it worthwhile, and decide to continue, you face a challenge: how to merge future voter files with less wear and tear on the staff's time schedule. The solution to this problem depends entirely on how the voter data came to you. You could modify your database so that the voter information would get refreshed every time a new voter file for your locality is issued. For this to work effectively, you will need to be able to match the voter record with the member record. This can present a challenge if you don't have the voter id stored with the member's record. With the voter id in both files, you've got a lot more freedom to update your member records when new data comes in. There are a couple of challenges with doing this: 1) it's a chore getting the voter data into your member file the first time and then keeping it up as you add people; and 2) depending on your voter data source, the voter id may be in flux until all the technology changes triggered by the Help America Vote Act settle down. Generally, if you receive an enhanced member file, it came as a result of an exchange that your organization did with a coalition or service that agreed to update the voter information into your member record. In that case, you only have to find a way to merge the data table that you receive back into your database. This is pretty straightforward if you still have your database's unique record id in the file shipped back to you. This is not that easy to do though if you don't have someone with the technical chops to do the merge into your database system. More and more, we're seeing voter projects run from databases that are online and accessed via the internet. This can be a great boon to your project as it requires little or no technical support to get immediate access to high quality voter data. All it requires is internet accesss via a web browser. 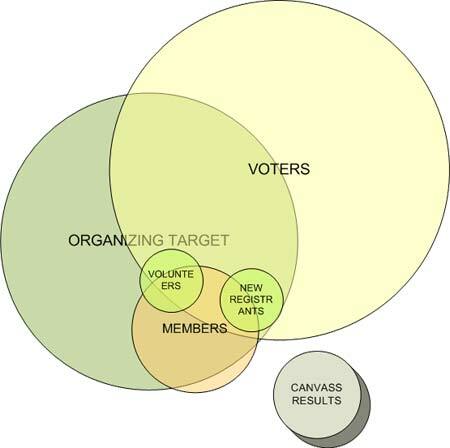 On the other hand, if you want to integrate the canvass results and voter information into your own database, you'll need a mechanism to download "your" voters and supporting data and then some technical support to import it into your database. This extends the "External File" approach described above. In this approach, you upload your in-house database to your online voter database supplier. With this information in the online database, you can select sets of data using your membership status, or if you print walk lists, you can indicate which voter is one of your members or in your contact database. As you accumulate canvass data in the online system, you will still need to take the step of downloading the voter project results to your computer so that you can merge it into your in-house database.